Let's be honest: job hunting is tough, even if it's done online. Thankfully, the newest face to join the job application game is a familiar one. Google is working on a tool for posting job openings and managing applicants, allowing the internet search giant to take a stab at sites like LinkedIn and Indeed, as spotted by Axios. Though Google Hire's login page can be accessed, signing-in doesn't seem to actually work for the public just yet. Despite not being in operation, Google Hire looks to have already stirred a pot of controversy. Not long after it was spotted, outlets reported that Google Hire's process could allow employers access to an applicant's search history. 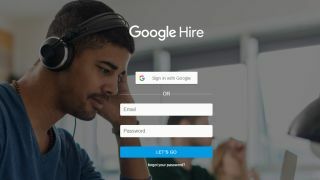 While users can sign-in to Google Hire with a personal Google account – which does have ample amounts of sensitive information tied to it – the service won't hand that data over to prospective employers. A Google representative has since debunked these claims of potential employer snooping, telling TechRadar that private information won't be shared with your potential new boss. "[Google Hire] will allow employers to collect candidate applications online," the spokesperson clarified. "Only information that a candidate voluntarily provides would be passed to a prospective employer as part of their online application." Google isn't the only one putting its spin on the job application process. Facebook has also played around with tools for finding people work, while popular-with-the-youth app Snapchat was recently used as part of the McDonald's hiring process in Australia.